The sizing is quite important in BJJ as any other martial arts and choosing the right size for your body directly affects your rolling performance positively and in this BJJ gi size guide, you will learn all about the gi sizing. I will also talk about the slim fit cut, classic cut and what to be careful about when you buy a certain cut. Also if you are skinny, have a fit body… you may want to read below as there are some quite good tips to get a better fit. First of all, a gi brand may have a different sizing chart than the others. Also, many gi brands like Hypnotik may use different sizing for the gis. For example, some gis have A2 model which has different wingspan. So always check out the brand’s sizing chart. However, you can get most of the jiu-jitsu kimonos on the market according to the information below. Many popular brands’ most popular models (Fuji, Hayabusa, Gameness…) can be chosen according to the data below. A0 5’0″ – 5’3″ 105-130 lbs. A1 5’3″ – 5’7″ 130-165 lbs. A1L 5’3″ – 5’9″ 130-190 lbs. A2 5’6″ – 5’9″ 165-195 lbs. A3 5’9″ – 6’2″ 195-215 lbs. A4 6’2″ – 6’4″ 170-240 lbs. A4S 6’3″ – 6’7″ 180-255 lbs. A5 6’4″ – 6’6″ 205-270 lbs. These are female sizes which start with the letter of F and kids sizes which start with the letter of M. Sometimes kids kimonos are represented with 0, 00 etc. This is a general gi sizing information. However, some brands might use different sizing. So definitely look at that particular brand’s sizing chart. With that being said, there can be more adult sizes like A7, A8. Some companies even go crazy and there can be sizes up to A17 but this is quite rare and generally, you are not likely to find an exact size for your body. You may notice that some brands have A2L, A2F, A2H sizes as well. What do these mean? Let’s say that you have a bulky body and if your body is close to A2 size (sleeve length etc.). Then go for H sizes. If you are on the skinnier side, go for “L ” size of that model. But keep in mind that many brands don’t produce these in-between sizes. As a side note, these models are generally pearl weave. I really don’t understand why almost every company prefers this weave type but the reason might be that it is considered the best weave type. Alright, some brands do actually put in a lot of work and have a lot of different sizes. If your body falls into standard measurement go for A0, A1 etc. However, you may have a bigger chest for the size. Then look for brands which have H sizes. “H” sizes have a larger chest, shoulder compartments for the particular size (A2H etc.). Alright not everyone can find an exact size for his / her body. Actually, %50 of the practitioners wear one which provides a good fit and not excellent fit. So you might be a bit tall for one size and you can be swimming in a bigger size. Then you should go for the small size as it will not be baggy and do not inhibit the freedom while you are doing grappling. If you need a large model (having a bigger chest, shoulders etc.) you need large sizes. So you can move your shoulders, arms well. Also, always consider the shrinkage. Some weave types shrink more than the others. Also, some brands’ gis are made of some special blends and obviously these shrink at a different rate. How do you understand the shrinkage of “special” blends? Well, learn which weave types are used. Then, use the comparison above. However, remember that the important factor is the percentage of the weave types when it comes to the shrinkage. You can use different shrinking methods for the parts which don’t fit well. Important Note: Some brands have different Europe and US sizing. So be sure to have a look at that as well if the company has different sizing for models in the US and Europe. Skinny Guys: You may not find a model which fits well. In that case, go for short models. The pants and sleeves will be shorter but the body part will fit just right. If you have this body type, you can also look for “L” sizes. Fit Guys: Fit guys can choose slim cut gis as these fit better, compliment their body and leave less fabric to hold for opponents. If the gi fits well, canvas pants and pearl weave is a good combination as it shrinks less. If it fits well you can roll with this kind of gi for a really long time. That is a good tip right there so use it. Some brands also have F sizes (A2F etc.) which have a more tapered design. Big Guys: If you are a big guy and the body part is alright, you will be swimming in the gi (long sleeves, trousers). When it is the case, you can just shrink the gi in hot water. Or pour hot water on parts, which are needed to be shrunk, then let it air. After a couple of trials, you can figure out what the optimal size is for you. But there is one drawback. This gi will be a bit heavier than usual. But this is perfectly normal as you shrink a model and it can’t be as light as the smaller size because well a bigger size gi is just shrunk now. Let’s say that you shrink A3 size gi. Now the sleeves, pants are shorter. It has A2 measurements for sleeves but the gi has more material quantity than A2. When this is the case, the gi is heavier than A2. But you don’t sacrifice freedom of movement and comfort here. There are also H sizes of a few brands for big guys. However, there are competition requirements on the IBJJF site and your gi should fit these criteria so you can compete in tournaments. 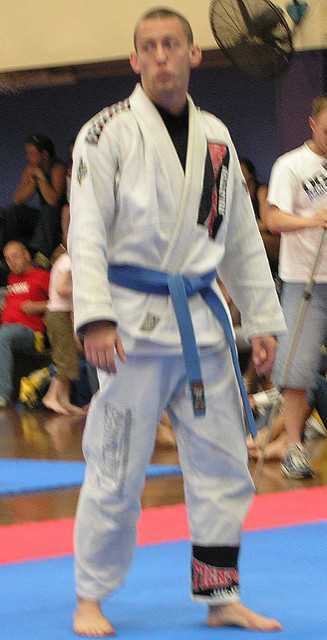 These criteria include the sleeve length, how much the gi can be tapered etc. So you may not compete with the gi which you train with. There are also some certain materials which can be used for competition. Some models come preshrunk and there will not be much shrinkage after a couple of washes. If you don’t like the fit again, you can iron a gi for some more shrinkage. After doing these, it might provide a better fit. As a side note, the gi, which is not preshrunk, shrinks around %8 after the first wash. When the gi fits right, your opponent has less fabric to make a grip. You will also do grappling techniques relatively better and escape better. So getting the right fit makes all the difference in the world. There are different cut types including slim fit. The slim fit cut is tighter and may provide an excellent fit for certain people. This is actually my preference as I have a lean body and these fit excellent. With that being said, the sides can be extra tight and can make you slower and this is an issue. So choosing a right cut may be tricky and you need to check out the sleeve measurements, chest width, and pants’ cuff. It is important to note that your first gi is not likely to be perfect and trying out different models and cut types are inevitable. However, as long as the measurements are alright it will do the job just fine while doing submissions. Getting the wrong size is the absolute worst thing. Imagine that every opponent can make a strong grip on the body part of the jacket and you lose the match because of that. You would not want that to happen, right? The right fit provides lightweight so you can move fast. It also will not be loose so your opponent has less opportunity to make a grip. You see the choosing process is quite important. This writing will definitely help you choose the right BJJ gi size. It includes everything about it including the sizing charts, important tips to have a good fit and tips for different body types. However, if you have any other questions or want to share your experiences about this topic just have a comment below!